1. Even though this originally aired way back in January 2014 during the Super Bowl, I have been obsessed with the jingle for the Oreo commercial, sung by Tegan and Sara, the identical twin singing duo from Canada. I have periodically looked for a full version of this song, without success. Have you heard this commercial jingle, and do you like it? Heard it before and agree it's great! 2. Have you ever tried to find a full length version of a song from a commercial you heard and liked? 3. I love the message of this song -- even though I know it's really just about Oreos. The song says we should not judge people based on what they look like, and instead let our curiosity allow us to find out who they really are. Do you feel it's a positive message illustrated in a fun way? 4. 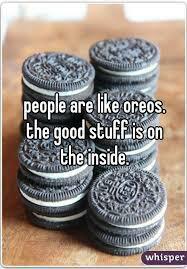 What is your favorite flavor of Oreos?